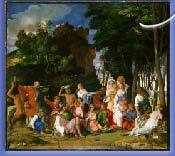 AROUND 1512, the Duke of Ferrara commissioned Giovanni Bellini to paint this masterpiece of the Italian Renaissance, which now hangs in the National Gallery of Art in Washington, D.C. Dosso Dossi subsequently decorated a gallery for the Duke, and, in 1522, painted over half of Bellini's canvas. Seven years later, Titian repainted the Feast of the Gods again. What did the earlier versions look like? How much of each artist's work do we see today? What motivated these unprecedented changes? FOR CENTURIES these questions remained unanswered. In the last Fifty years, technical innovations in conservation science have enabled specialists at the National Gallery to obtain X-ray, infrared and cross-section data. This information has proved crucial in dispelling the mystery surrounding this painting.